Noël Coward, like the famous wits—Congreve, Sheridan, Wilde and Shaw—to whom he has been compared, had a certain way that set him apart, larger than life. In a tribute written for the occasion of Coward's 70th birthday in 1969, Time magazine called this special quality "a sense of personal style, a combination of cheek and chic, pose and poise." In Present Laughter, Coward set out to mock these well known and beloved traits in the character of Garry Essendine, which provided Coward with a bravura part. Coward called the piece a "light comedy." One imagines that even in self-caricaturizing himself, Coward performed it with a certain dryness for which English humor, which he helped define, is famous. Chris Bleau dons Coward's egocentricity like a glove, or rather, like the legend's trademark dressing-gown, but perhaps it is the absence of Coward's constant cigarette (and long holder for effect) that begged for choices other than the dry, reserved posture that generated the ever-present mirth of the original. Regardless, the farcical pace and trappings often work against Coward's style of writing and acting, attempting to substitute amusement for bemusement. Nevertheless, there is plenty at which to laugh, as Gary is besieged by women and men alike, each wanting some form of personal enrichment that the celebrity's allure promises to deliver: There is the alternately effervescent and pouty Daphne (Kelly Reeves), the first to emerge from the "guest bedroom"; the irresistable, calculating sultry siren, Joanna (Rachel Bouchard), who seduces Gary against his better judgement (Ann Piano's Paris designs are a wonder on Bouchard); and the wacky Roland Maule (Christian Mast), an aspiring but talentless writer. Even Gary's business associates, Morris (Tim McGrath) and Hugo (David Blumenstock), and the hired help, Fred (Jack Wefso) and Miss Erikson (Erica Johnson), drive him batty. If it weren't for Gary's estranged but understanding wife, Liz (Adrian Egolf), and his loyal and tireless secretary, Monica (Haley Johnson), life would certainly be impossible. Thankfully, when Lady Saltburn (Crystal Verdon Eisele) arrives, the impossible forces are finally, and surprisingly, resolved. 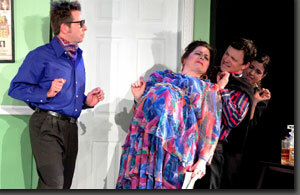 Miners Alley Playhouse's production of Present Laughter runs through February 12th. 303-935-3044 or www.minersalley.com.